Social selling has killed cold calling. Or, has it? 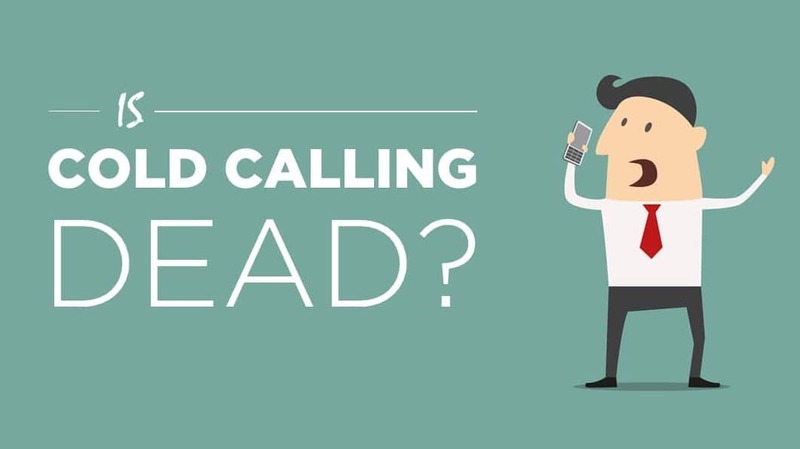 How often have I heard that cold calling is dead? Social media devotees proclaim its death with glee as a direct correlation to the inexorable rise of social media and what they proclaim is ‘social selling’. But, there’s something distinctly disturbing about both assertions i.e. that cold calling is dead and social selling is the new black. The first aspect is that we’re all supposed to believe that there is now only one way; that everyone must go social to survive since it’s intimated that it’s now the only ‘sensible’ way businesses can generate valid sales leads. The second is that cold calling is a flawed concept and is the wicked witch of marketing to the white witch of social. Both of these assumptions are incorrect. There is no right or wrong. It’s what works that counts. As readers of my blogs will know, I am a fan of what social media marketing can bring to a business. The fact that I’m writing this blog, and that we have almost 400 pieces of content including, blogs, videos, and infographics on our website illustrates that point. Content, delivered through social channels, increases credibility and visibility if you build a social network for your target market. Without the network, you don’t get the reach and your efforts will fall on deaf ears. However, organic reach through social media has become increasingly hard to achieve. LinkedIn, for example, wants you to pay for advertising. It’s the same with Facebook and other social channels. Social media reach is no longer free. With the above in mind, the concept of social selling held up on a pedestal by many, is tough to deliver for most SMEs and for a fair chunk of large businesses. It is not just about posting a few blogs and videos and hoping for the best. That’s where you need internal staff to manage the whole process from cradle to grave (content development to content distribution and syndication) or engage the services of a social media expert and software. It’s far from a quick fix. Awareness, credibility, visibility are key objectives for every business if it wants to succeed whether that’s at a local, national or international level. Yet, social can only go so far in the same way as advertising or any other marketing. There’s never a guarantee that your target customer will see what you post or have a need at the time they happen upon your content. It’s no different to other methods in that respect. Whilst you can, of course, be proactive (e.g. to build your network and engage with them) you must often wait for your prospects to find you and engage. Now, this isn’t a rant against social media marketing or social selling. Indeed, as explained earlier, I am a fan if done correctly. Yet, all too often, social selling is proposed as an alternative to the ‘recently deceased’ cold calling. But, so many large and small companies still effectively utilise telemarketing as a route to market. I prefer the term telemarketing to cold calling. Whilst there is usually an element of cold calling to a fresh prospect list involved in this aspect of marketing, it doesn’t tell the full story when you label every kind of calling with the term cold calling. There are many types of call. I could go on. And, yes, we can add cold calls to a targeted list to the above. If the data is good, even cold calling can be effective. The thing is that with telemarketing, you are being proactive. You don’t have to wait until they come to you. Of course, a tailored target list is essential if you’re making calls of the cold kind. But, whilst there is inevitable wastage (prospects that have left the business, no name policies, gatekeeper blocks etc), that wastage is no different to other channels and where prospects on social media either don’t see or ignore your efforts. The difference is that you can laser target your prospect. LinkedIn also allows you to do this via inmails and messages to your first level contacts and we’d encourage you to do this too. But, not everyone is ‘active’ on social media. A quick search on sales navigator will confirm that, since it shows you who has been ‘active’ in the past 30 days. A search we ran in the last few days found 557 results. Of these, only 35 had posted on LinkedIn within the last 35 days. That’s not to say they haven’t been on LinkedIn, but it does point towards their level of activity. Through telemarketing, we’ve generated significant numbers of leads and revenue for a myriad of different businesses in different sectors with wildly varying services and target sectors. We receive new leads daily for our services, since businesses operating in the b2b arena still look for effective routes to market and include telemarketing in their search. That’s sometimes when other routes have failed and/or where those other methods aren’t delivering enough qualified leads. The reason they still utilise telemarketing is that you can qualify your prospect directly when you speak to them. So, my message is to all those social media groupies out there. Promote social selling as a discipline, by all means. I advocate the use of valuable content to generate visibility, credibility, awareness and interest through social channels. But, stop trying to do promote social selling as the answer to everything by dissing traditional methods of lead generation. Those methods have worked and continue to work for many businesses. Perhaps, millennials may respond less well in time. Despite this, telemarketing remains one of the best ways to generate qualified sales leads and is still perfectly acceptable under new GDPR rules for companies both large and small. GSA helps businesses, large and small, become more effective in their marketing and business development. We run outbound telemarketing campaigns into the UK, Europe and further afield. Also, with our experience, we provide telemarketing training to help sales teams improve their results. If you’d like to know more, give us a call. Are you missing big customer opportunities through lack of database management?